#HSAP-14-FW: 16 gauge type 304 stainless steel all-welded construction. 14" x 16" x 5" bowl with generous 5/8" radius. Inverted V" edge rim design to retard deck spillage. Deck mounting faucet comes standard with wrist handles. Standard wall brackets for added strength and stability. Water inlet: 1/2" NPT. Drain outlet: 1 1/2" NPS. 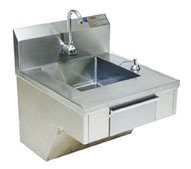 ADA" Hand Sinks: 16 gauge type 304 stainless steel construction. 14" x 16" x 5" sink bowl with 1 1/2" stainless steel basket drain. 6-volt battery-powered electronic-eye faucet with built-in low-battery indicator. Deck mounted 16 oz. soap dispenser with chrome valve. C-fold paper towel dispenser, 4" x 10". Heavy gauge type 304 stainless steel skirt assembly with accessibility from bottom to change faucet batteries. Marine edge on front and sides to retard spillage. Chrome-plated p-trap. Includes stainless steel Z" bracket for mounting to wall. Water inlet: 1/2" NPT. Drain outlet: 1 1/2" NPS.